Saint Lawrence of Brindisi (July 22, 1559 – July 22, 1619), born Giulio Cesare Russo, was a Roman Catholic priest and a member of the Franciscan-inspired Order of Friars Minor Capuchin. A major figure of the Counter-Reformation, he was beatified in 1783, by Pope Pius VI, canonized in 1881 by Pope Leo XIII, and declared a Doctor of the Church by Pope John XXIII in 1959. His feast day is July 21. Born in Brindisi, Kingdom of Naples, to a family of Venetian merchants, Lawrence was educated at Saint Mark's College in Venice and joined the Capuchins in Verona as Brother Lorenzo. He received further instruction from the University of Padua. He was appointed "definitor general" at Rome for the Capuchins in 1596. A gifted orator, Pope Clement VIII assigned him the task of converting the Jews in the city. Beginning in 1599, Lawrence established Capuchin monasteries in modern Germany and Austria, furthering the Counter-Reformation and bringing many Protestants back to the Catholic faith. In 1601, he served as the imperial chaplain for the army of Rudolph II, Holy Roman Emperor and successfully led the imperial army against the Ottoman Empire, armed only with a crucifix. In 1602, he was elected vicar-general of the Capuchins. After retiring from that office in 1605, he entered the service of the Holy See as a diplomat and continued his preaching against the Reformation. He retired to a monastery in 1618 and died on his birthday in Lisbon returning from a final diplomatic mission. He is a highly regarded saint in the Catholic tradition, however he was a bold adversary of Protestants, Muslims, and Jews, living in an era when "loving one's enemy" was considered less important than vying against him. Born at Brindisi in 1559, the future Saint Lawrence received the Italian baptismal name of Giulio Cesare—Julius Caesar. His father was Guglielmo de Rossi, a merchant, and his mother was Elisabetta Masella. Both were pious Catholics, and their son gave early evidence of a religious vocation. He was educated under the Conventual Franciscans of Brindisi. Already a gifted speaker by the age of six, he was consistently chosen to give the annual children's sermon on the Baby Jesus during the local Christmas festivities. When Giulio was aged 12, his father died, and he was sent to Venice to be educated with the clerics of St. Mark's Cathedral under the supervision of one of his uncles. In 1575, he was received into the Order of Capuchins, who followed a strict Franciscan rule. He adopted the name of Brother Lorenzo and devoted himself to philosophical and theological studies at the University of Padua. Owing to his excellent memory, he mastered not only the principal European languages, but also most of the Semitic tongues. It was said he knew the entire original text of the Bible. Pope Clement VIII assigned Lawrence of Brindisi to preach Catholicism to the Jews, and later to the Protestants. When still a deacon, he preached the Lenten sermons in Venice. His gifts as an orator were so great that he was soon called to all the principal cities of Italy to preach. His method of preaching was modeled after the great Franciscan missionaries, aiming primarily to reach people's hearts and was ever mindful of the particular spiritual needs of his hearers. Lawrence held that God, even more than being a Creator, the source of Almighty Power, or a Judge, God is first and foremost a Lover. He taught that, even if Adam had not sinned, God still would have sent Jesus to humankind to share God's love. 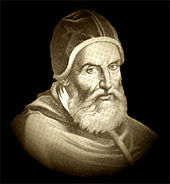 From 1596 to 1602, he served as the Capuchin's "general definitor" in Rome, where Pope Clement VIII assigned him the task of preaching to the city's Jews, the Jewish population of the city having increased due to the pope's requiring the Jews of Italy to concentrate themselves in the ghettos of Rome and Ancona. Due in part to his knowledge of Hebrew, Lawrence reportedly convinced a substantial number of the Jews to covert to Catholicism. His success in Rome caused him to be called to several other European cities, where he also baptized a number of Jews. At the same time, he was commissioned to establish houses for his order in Germany and Austria. He faced serious challenges due to the progress of the Protestant Reformation, but succeeded in establishing monasteries at the provincial capitals of Vienna, Prague, and Graz. Rudolf II placed Lawrence of Brindisi at the head of the imperial army which marched against the Ottoman Turks. At Prague in 1601, Lawrence was named chaplain of the imperial army, which was then about to march against the Ottoman Turks. The Ottoman leader Mohammed III, since his accession in 1595, had conquered a large part of Hungary. 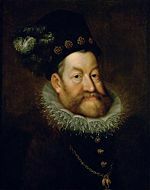 Holy Roman Emperor Rudolf II, determined to prevent a further advance, sent Lawrence as his deputy to the German princes to obtain their cooperation. They responded to his appeal, and the Duke of Mercœur, who was also the Governor of Brittany, took command of the imperial army. With 18,000 men, he prepared to attack 80,000 Turks and appealed to Lawrence for spiritual aid. Lawrence delivered a glowing speech to the troops, inspiring them with confidence that they fought on the side of God. He then mounted on horseback and, crucifix in hand, took the lead of the army, boldly exposing himself to the enemy. The fact that he was not wounded was regarded as the result of miraculous protection. The city of Albe-Royal (now Stulweissenburg) was finally taken, and the Turks lost 30,000 men. A second battle then ensued, with Lawrence again in the lead. "Forward!" he reportedly cried, holding aloft the crucifix, "Victory is ours!" The Turks were again defeated, and the Duke of Mercœur attributed the honor of this double victory to the help of God and the leadership of Lawrence of Brindisi. On the strength of his accomplishments at the Chapuchin chapter (convention) of 1602, Lawrence was elected the order's vicar-general, the highest position in the Capuchins' constitution at the time. He quickly began a tour that took him to Milan, Paris, Marseilles, and several cities of Spain. His reputation for holiness preceded him, and people flocked to hear him preach and to receive his blessing. Lawrence was instrumental in convincing Phillip III of Spain to join the Catholic League. Lawrence's administration was perceived as a great benefit to the Capuchin Order, and at the chapter of 1605 he was offered a second term as vicar-general, which he declined to accept. He was then sent by the pope to evangelize Germany. He worked to confirm the faith of the Catholics and reportedly brought back a great number of Protestant "heretics" as well. When some of the Catholic princes of Germany formed the anti-Protestant alliance known as the "Catholic League," Emperor Rudolph II sent Lawrence to Philip III of Spain, where Lawrence succeeded in persuading the king to join the League. He simultaneously acted as the ambassador of both the pope and of Madrid at the court of Maximilian I, Elector of Bavaria, head of the Catholic League, in Munich. At the same time, he acted as his order's administrator for the provinces of Tyrol and Bavaria and as spiritual director of the Bavarian army. When a dispute arose between the Catholic princes, Lawrence acted as arbiter. In addition to all these occupations, he undertook a missionary campaign throughout Germany to deal with the Protestant challenge. He thus traveled for eight months in Bavaria, Saxony, and the Palatinate, together with several Capuchin colleagues. Lawrence withdrew to the monastery of Caserta in 1618, when he was requested by the leading men of Naples to go to Spain and apprise Philip III of the dubious conduct of the Spanish Viceroy Pedro Téllez-Girón (the Duke of Osuna). The viceroy attempted to prevent his departure, but Lawrence finally sailed from Genoa and carried out his mission successfully. However, the fatigue of the journey exhausted his strength, and he was unable to travel homeward. After several days of suffering, he died at Lisbon on July 22, 1619. He reportedly predicted his death when he set out on his journey. He was buried in the cemetery of the Poor Clares of Villafranca. Amid so many busy undertakings, it is perhaps the greatest marvel of Lawrence of Brindisi's life that he was able to combine his external duties with a rich and contemplative inner life. He often fell into ecstasies while celebrating the mass, was deeply devoted to the practice of the rosary, and reportedly worked miracles in the name of the Virgin Mary. From the viewpoint of Roman Catholicism, Lawrence's life was clearly that of a great saint. At the same time, we cannot ignore the fact that to Jews, Protestants, and Muslims alike, he was an enemy. "God called me to be a Franciscan for the conversion of sinners and heretics," he often said, no doubt meaning this in love. Yet, to the Jews and Protestants, he threatened damnation if they did not accept Catholicism, while to the Muslim infidel he displayed the crucifix of the Christ of Love, as the soldiers behind him brandished swords and muskets. The known writings of St. Lawrence of Brindisi comprise eight volumes of sermons, two didactic treatises on oratory, a commentary on Genesis, another on Ezekiel, and three volumes of religious polemics. Most of his sermons are written in Italian, the other works being in Latin. The three volumes of polemical writings have notes in Greek and Hebrew. The process of his beatification was concluded in 1783, and he was canonized as a saint in December 1881. Together with St. Anthony of Padua, St. Bonaventure, and Blessed John Duns Scotus, he is a Doctor of the Franciscan Order. In 1959, Pope John XXIII proclaimed him a Doctor of the Universal Church. His feast is kept on July 6.
da Carmignano, Arturo. St. Lawrence of Brindisi. Westminster, Md: Newman Press, 1963. OCLC 3244333. McGinn, Bernard. The Doctors of the Church: Thirty-Three Men and Women Who Shaped Christianity. New York: Crossroad Pub, 1999. ISBN 9780824517717. St. Lawrence. Collected Sermons and Homilies of St. Lawrence of Brindisi in Twelve Books. Delhi: Media House, 2007. OCLC 241519400. All links retrieved June 22, 2018. History of "Lawrence of Brindisi"
This page was last modified on 22 June 2018, at 14:37.